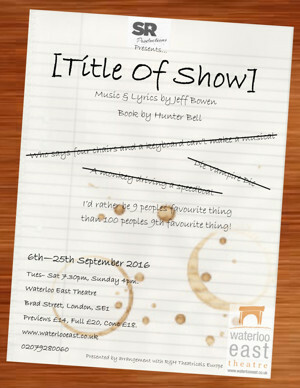 SR Productions will present brand new production [title of show] which will play from 6 to 25 September 2016 in a limited run at the Waterloo East Theatre. This will be the first London production since its London premiere at the Landor Theatre in 2013. The cast will include Daniel Mack Shand as Jeff, Louie Westwood as Hunter, Chloe Hawkins as Heidi and Malindi Freeman as Susan. The director will be Will Keith and the musical director is Daniel Jarvis. Featuring music and lyrics by Jeff Bowen and book by Hunter Bell, the show follows two struggling writer-composers who decide to write a musical about two struggling writer-composers trying to write a musical with the help of their two best friends. The show was originally presented at the New York Musical Theatre Festival in 2004 and went on to run off-Broadway at the Vineyard Theatre in 2006. It transferred to Broadway's Lyceum Theatre in 2008 where it ran for 13 previews and 102 regular performances. Writer/stars Bowen and Bell, as well as director Michael Berresse all won Obie Awards for their work on the off- Broadway production. 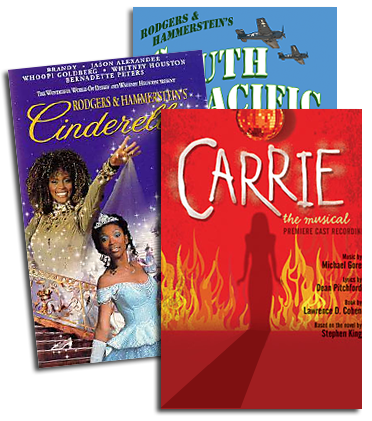 The musical also received a Tony Award® nomination for Best Book of a Musical in 2009.